So I stuck it in my XP box, giving me a total of 6GB. Brilliant thing to do for a 32-bit OS that only supports 2GB, right? Well then you get this thing called Ramdisk Plus. And you make a 3GB Ramdisk in "unmanaged" mode, which XP mostly doesn't notice because it doesn't care. And then you tell Photoshop it can use that disk to swap. And oh boy, it does. 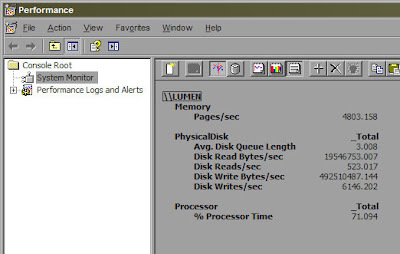 Here's perfmon showing 6000 writes/sec at about 500MB/sec while running "Add Noise". It does more than that if you ask nicely.